There are some things I cannot stand. One is the sound that the Morton Salt container makes when you open the aluminum spout, another the pissy little brat who works at the counter where I buy my make-up at the mall and last, but certainly not least, is when children call me (or any other adult for that matter) by their FIRST NAME! Never, in a million years, would I have dared to address one of my mother’s adult acquaintances by their first names. I would have gotten the stare down of the century followed by a verbal beat down on the way back home. I wouldn’t even have attempted it. I was taught that if an adult’s name did not already come with a prefix such as Aunt/Uncle then you can either call them Mr./Mrs./Miss followed by their last name or, to be a bit more casual with people your parents are close to, Mr./Mrs./Miss followed by their first names. For example, Jane Smith would either be Miss Jane or Mrs. Smith, never Jane and certainly never hey Jane. That is why I cannot fathom why some people can allow or even condone and encourage their children to do so without even a thought that it may be misconstrued as disrespectful or rude. I often hear my kids address adults as Mrs. so and so and they are instantly met with “oh, no that is my mother/father, call me ….” and I understand that is their choice but it still bothers me. In my eyes it exudes disdain and disrespect towards their elders. What do you think? Are you ok with kids calling you by your first name? How do you teach your kids to address adults? This entry was posted in Everything else, Family, Parenting, Uncategorized and tagged addressing adults, kids, life, Manners, Mr., Mrs., respect. Bookmark the permalink. 4 Responses to Excuse me?!?!?! 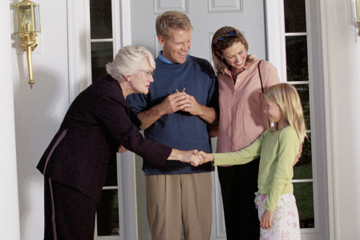 I’ve taught my kids to always address adults with a Aunt/Uncle or Mrs/Mr–it’s a total sign of respect. I always get bowled over when a five year old calls me by my first name, and does so without batting an eye! Of course, once I ask them to call me Mrs blah blah, they get it. I am always surprised that some kids are hearing this request (to be addressed respectfully) for the first time and seem confused. I was JUST talking about this with my sister and neighbor last night. Many of my neighbor children call other adults by their first name and presumed they could do the same with us. Um, not quite. I never called an adult by their first name unless, as you said, it had a prefix of Miss or Mr.
My children do not and will not call an adult by their first name – until they are an adult themselves. I agree, it just seems so cut and dry but you would be surprised how many people do not agree with us and actually prefer to be addressed by their first name by children. Go figure.